Adam Smith was born in Kirkcaldy, Fife, Scotland. The exact date of his birth is unknown, however, he was baptized on June 5, 1723. Smith was the Scottish political economist and philosopher, who became famous for his influential book "The Wealth of Nations" written in 1776. In 1751 Smith was appointed professor of logic at Glasgow university, transferring in 1752 to the chair of moral philosophy. His lectures covered the field of ethics, rhetoric, jurisprudence and political economy, or "police and revenue." In 1759 he published his Theory of Moral Sentiments, embodying some of his Glasgow lectures. This work was about those standards of ethical conduct that hold society together, with emphasis on the general harmony of human motives and activities under a beneficent Providence. 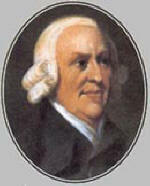 Smith moved to London in 1776, where he published "An Inquiry into the Nature and Causes of the Wealth of Nations," which examined in detail the consequences of economic freedom. It covered such concepts as the role of self-interest, the division of labor, the function of markets, and the international implications of a laissez-faire economy. "Wealth of Nations" established economics as an autonomous subject and launched the economic doctrine of free enterprise. Smith laid the intellectual framework that explained the free market and still holds true today. He is most often recognized for the expression "the invisible hand," which he used to demonstrate how self-interest guides the most efficient use of resources in a nation's economy, with public welfare coming as a by-product. To underscore his laissez-faire convictions, Smith argued that state and personal efforts, to promote social good are ineffectual compared to unbridled market forces. In 1778 he was appointed to a post of commissioner of customs in Edinburgh, Scotland. He died there on July 17, 1790, after an illness. At the end it was discovered that Smith had devoted a considerable part of his income to numerous secret acts of charity.